INCHEON, Sept. 3 (Yonhap) -- South Korea's under-23 national football team players returned to a heroes' welcome Monday after winning the gold medal at the 18th Asian Games in Indonesia. South Korea defeated Japan 2-1 in extra time to claim their Asiad men's football title. Lee Seung-woo and Hwang Hee-chan scored a goal apiece at Pakansari Stadium in Cibinong, south of Jakarta. "We earned a good result because of our players' hard-working effort," Kim said. "We want to thank our football fans for supporting us." Three wild-card members -- Son Heung-min, Hwang Ui-jo and Jo Hyeon-woo -- were pivotal for South Korea's gold medal run. Son was the captain of the team, while Hwang finished the Asian Games as the top scorer with nine goals. Jo conceded only two goals in the five matches he played. "The three players did more than what they were supposed to do," Kim said. "They really lead their young teammates well." With the gold medal, the 20 players are now exempt from their compulsory military service that is about two years long. They can now take a basic four-week training program for the service. Among the Asian Games members, eight players will have to continue their international duty as they also received a call-up from the senior national team. Son Heung-min, Hwang Ui-jo, Jo Hyeon-woo, Hwang Hee-chan, Lee Seung-woo, Kim Min-jae Hwang In-beom and Kim Moon-hwan will now work with Paulo Bento's squad for upcoming friendly matches. South Korea are scheduled to take on Costa Rica on Friday and Chile four days later. 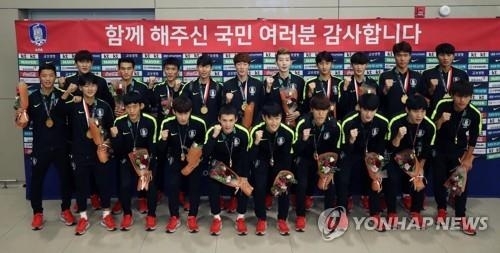 The Korea Football Association (KFA) said the eight players who competed at the Asian Games will join the senior national team at the National Football Center (NFC) in Paju, north of Seoul, on Tuesday. The other 16 players will begin training at the NFC later Monday.